My gut healing journey has been an eye opening experience. It's been exactly a year since the day I decided to give up gluten and dairy for good. It stands out as it was decisive and transformative. I vividly remember driving home from work, listening to a podcast on gluten sensitivity. What I was hearing hit me like a pile of bricks. I finally asked the question: "could gluten be at the root of all the issues I'd been struggling with?" I had to put the theory to the test and it turned out to be the best decision I ever made. If you want an in-depth read about gluten, check out this post. If you're wondering why I gave up dairy as well - the answer is simple. Like gluten, cows milk proteins act as an allergen and can cause a similar immune response. But let's get back to the gut and more importantly to how to make sauerkraut. When it came to healing my gut, removing trigger foods and allergens was good but not enough. Working towards re-building what had been broken for so many years required that I focus on repopulating my gut bacteria. One surefire way I've done this probably the best way is by consuming fermented foods regularly, in particular sauerkraut. The stuff is truly miraculous. I believe out of all fermented foods, sauerkraut packs the most benefits in a very small serving. Some sources state that something like 10 trillion live bacteria can be found in just two ounces of home made sauerkraut, which is the equivalent of a 100 count of bottled probiotics. 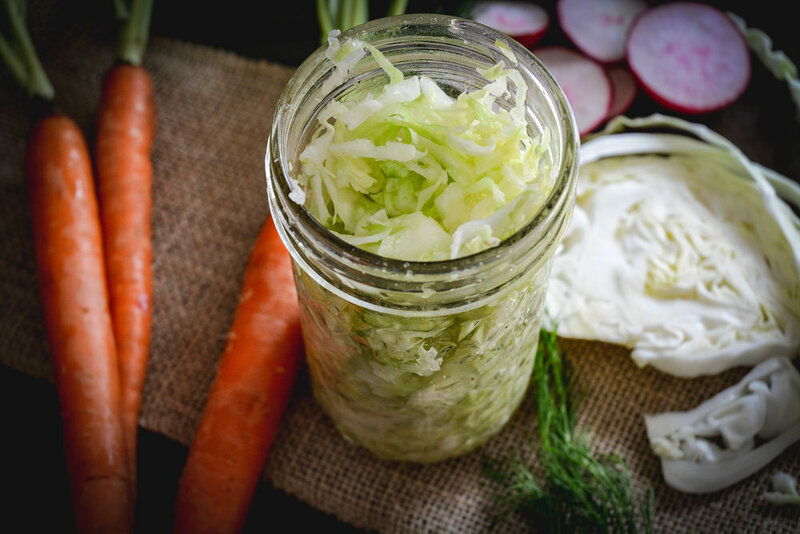 Another interesting article on the benefits of consuming sauerkraut and fermented food sheds some scientific light on this ancient food. My reasons are cost effectiveness and also knowing exactly what goes into it. A small jar of refrigerated sauerkraut that contains only salt and cabbage usually costs somewhere around $4-$5 dollars. Making your own will save you money and yield far more sauerkraut. One word of caution. If you've never eaten sauerkraut before, I suggest starting out with only 1 tsp and building up to a few table spoons a day. Eating too much too soon can actually have some negative side effects such as upset stomach or diarrhea. I keep things very basic by using clean mason jars, one head of cabbage, that's been finely sliced and fine pink salt. I prefer pink salt because of the milder taste and added nutrients. 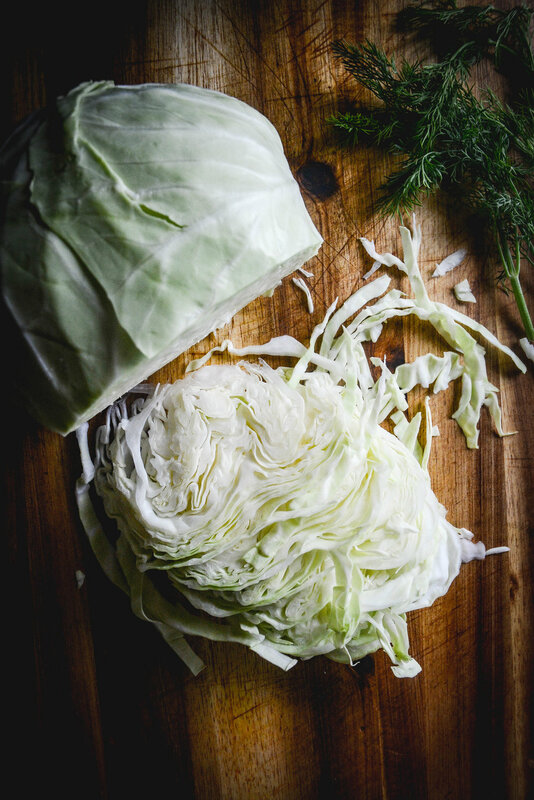 You can either hand hand massage the cabbage and salt together or you can use a sauerkraut pounder in order to speed up the process. You can also choose to use a fermenting stone but it's certainly not a requirement. Ensure your work space is clean. Wash and dry mason jars. Cut cabbage in two and and finely slice the cabbage. Add to bowl along with salt and massage cabbage with both hands or sauerkraut pounder for about 5-8 minutes until cabbage starts to release a liquid. Stuff cabbage in jars and pour in liquid dividing it between jars. Press the cabbage firmly into jar ensuring the liquid bubbles to the surface. Option is to add fermenting stone. Twist on lid firmly and store in a cool, dark place and allow to ferment for 14 days to several months. Once you open the sauerkraut, store it in the refrigerator. 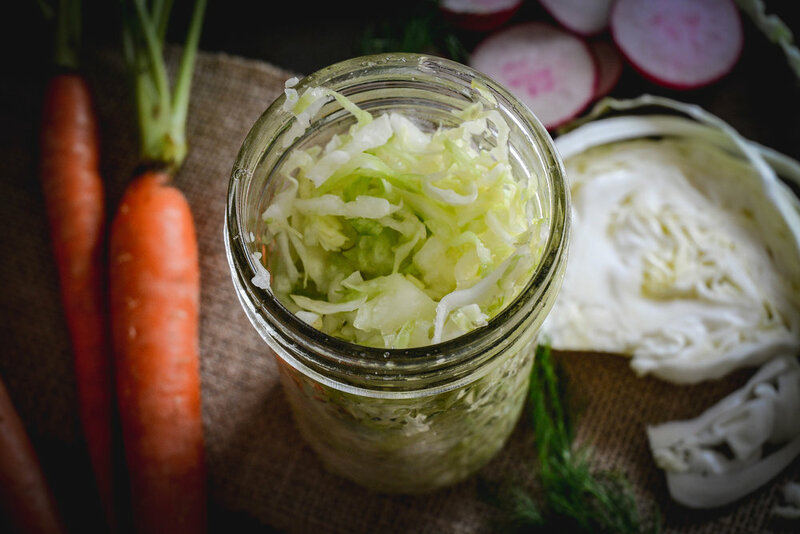 *Tip: While fermenting, keep sauerkraut away from fluctuating temperatures such as dishwashers and stoves. The ideal temperature is between 65-72 degrees Fahrenheit.